I got to see my hawk yesterday–twice. The second time, he flew in to just outside the window and perched awhile, choosing to be eye-to-eye for several minutes, a wild thing taking my measure. It made me want to measure up. He had a meal waiting below the window, but first things first. And I saw him Sunday after the kids and grandkids left, right on cue. Christmas Eve more blood tests were run and the day after Christmas, they told me. Who knew that feeling energetic was a symptom of disease? Fine, can I keep it? It can crash the heart? Oh. Okay. I remember when George HW Bush, his wife Barbara, and their dog Millie were all diagnosed with this at about the same time and some thought the change in him as they tweaked the replacement hormone levels after killing off his out-of-control thyroid possibly cost him reelection. I know they often name diseases after the person who got the press for describing them first, but I just have to say as an editorial comment on the word: Graves’ is a really, really laughably-stupidly-unhelpful thing to call what you’re going to tell patients they have, don’tcha think? Autoimmune diseases! Get them here! Collect them all! 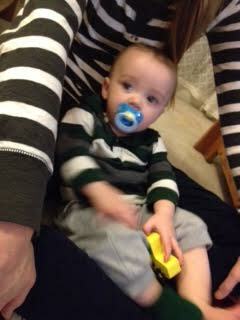 This is as close as we got to trying the digger sweater on him. Kim really wanted me to get to see him in it in person, but it’s okay. Note the flashlight in his hands: Parker is big on flashlights, he’d found one of Grampa’s super-duper ones, and no piece of clothing no matter how perfect was going to get in the way of holding on tight to it for every moment he was allowed to have it. Let there be light! And heavy! All in good time. The sweater may well be better off washed and dried first anyway, with hopes that it might felt together a bit against inquisitive fingers; being superwash, it won’t shrink. Hudson was back to happily snuggling into my shoulder today. 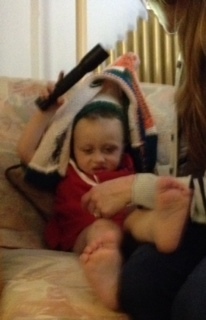 (Grandma pro tip: wear a cashmere sweater for sensory bribery, handwashed a few times to increase the softness. A seven-dollar hand-me-down worked just fine.) He and Parker giggled at the antics of a finger puppet in their daddy’s hands at church–and then they all flew off for home. And a good and far too brief time was had by all. (Photo taken Friday.) One sick feverish normally-easygoing baby screaming nonstop from 9 pm last night, right after they left here, till at 2 am they headed to the ER, getting out of there with an ear infection diagnosis at 5 am. We got a brief visit today. They were exhausted. There is nothing, nothing in the world like having a baby decide that your shoulder is a safe haven to take a good nap on. Or a big brother happily entertaining him when he wakes up. Or watching their daddy remind the older one, You can share but you can’t take it away–you have to give him a toy first. Right, right. Rules are still the rules in a new place, gotcha. The digger sweater: Parker gave it an appreciative Oh, that’s cool! look and would not take his eyes off it for a moment there, but, it being clothing and he being three, did not offer to try it on. But he was very glad that it existed and that it was his. 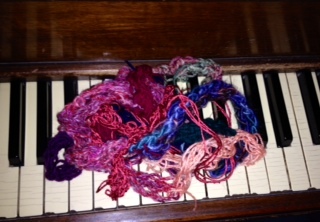 At the time they rang the doorbell, I had woven in all the ends and was sewing up the second side as fast as I could. About twenty seconds of work and tadaaah! I had the first sleeve on the needles but it was claimed as it came, a vest instead, which makes sense for their climate. Parker and I threw great bunches of colorful yarn confetti into the air to celebrate, again and again, all those snipped-off ends. My daughter-in-law swooned over that sweater, just couldn’t get over it. She is every knitter’s dream recipient, I tell you, just the best. Toys: the $12 Costco dinosaur in the toy basket for playing with at Gramma and Grampa’s was maybe a little too big right now: Parker picked the monster up with no complaints but just hauled it to the bathroom and firmly shut the door on it. Banished. He did, however, find the ukulule that was the survivor of the four $10 instruments we bought our kids back when they were little, a tad dusty, a string loose that Grampa quickly reattached for him and there you go. 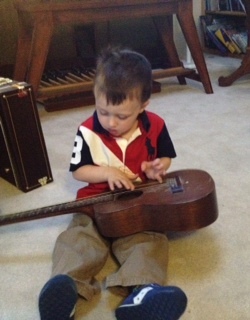 His daddy was playing with the guitar; he’d found himself a Parker-sized version. And then they were off to Kim’s grandparents’ for dinner. I need to start figuring out what Hudson’s sweater is going to look like. Dinner at Nina, Rod, and Gwynie’s. Good friends, good food, good times, (looking at the clock) g’night, and can’t wait till the grandsons tomorrow (got one sleeve cast on, at least.) Merry Christmas! Christmas eve breakfast arrived with a knock at the door: Krys had gone all out. Christmas eve dinner was spent with more friends. They are taking good care of us. I had a doctor’s appointment in the morning and we knew there would be more news–or not, really–later, we don’t know which yet. Starting this past Monday (yup, that week) it’s been that waiting time so familiar to many and they wanted more info. The machinery, it goes slowly. 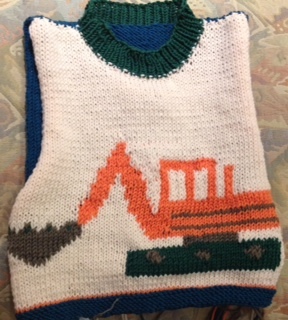 Meantime, the back of Parker’s sweater, it is done, and on the front, his very most favorite type of truck. With thanks to Robin, who snailmailed me her intarsia pattern after I couldn’t get the one I thought I wanted to print. I thought this one was too big–but my husband says the fact that it’s big and bold makes it all the more appealing to a boy. That made me think a minute: I’ve never been one, so that was good to know, and you know what? Clearly, especially given the reaction of that kid yesterday, he’s right. Wishing a happy and merry Christmas day for all and the peace of the season with your loved ones near and far. I’ve been knitting most of the past ten hours trying to make the sweater I’ve both envisioned and avoided this past month finally come to be. It would help if there were a set pattern for the whole thing, rather than me flipping between pages trying to kluge one together, but I do at least have a chart for the design. Which was big, which had to be worked around. As I told Sandi, I just have to start and then it will all be easy. When I admitted to Richard that I just didn’t feel that acrylic holds up well to extensive intarsia knitting, that I didn’t like the floppiness of it in that context and how it didn’t hold together but that I just didn’t have the good machine washable wool in that many colors in that weight on hand–he told me to go to Purlescence and just go buy them: Parker had to have a sweater like that. It would be just too perfect. And hopefully Hudson, too, but, I’m out of practice on sweaters and I’ve never done much baby knitting, much less toddler sizes, and so the amount of yarn needed was a pure guess. And I guessed wrong and the shop is closed till after Christmas and Richard-the-younger’s family is coming the day after. Which is why the background of the front is in cream but the back is starting at the teal trim at the bottom continuing on up in that color on that side. You work with what you’ve got. At one point I saw out the window a young dad playing with his three kids where the street dead-ends and I thought about it and then grabbed my project and ran out the door. Sure! Let’s see, she’s (pointing at his shy, petite daughter) two and a half. She however saw this stranger coming near her with this strange thing with weird dangly strands and understandably wanted nothing to do with me. I chuckled, understanding, and stepped back and tried to make her feel better about it while not imposing on her again. She watched me shyly while I did what I should have done first, which was to sound the all-clear by going to her five year old brother. Let him decide whether I was okay. He was eyeing that sweater front from the get-go with great appreciation: now that, that is something that could get a little boy excited about a piece of clothing. He liked it. Most definitely. Hey Mikey. And it was a tad small for him, as it needed to be, but whatever, the proportions are right so it’ll fit Parker later if not now. But that little kid did me the huge favor of letting me know this thing would pass muster at an older age if it doesn’t fit till later. I like to think Parker will never want to take it off no matter what size it is. I know the grandmother to those little ones. She’s a knitter. 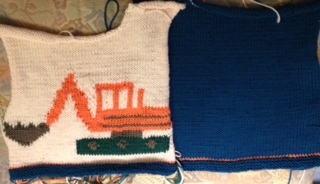 I’ll ask her quietly if she’d like to use the intarsia pattern when I’m done. HE’S HOME!!!!!! They were going to keep him till the middle of the grandsons’ visit, a whole ‘nother five days, and yesterday when he said, So I’m going home tomorrow, right? the nurses were sympathetic but the doctors gave that idea a yeah right look. So I was not at all expecting the call at 12:15 this afternoon saying they were sending him home and he was getting ready. Then immediately came the message from Phyllis and Lee saying they wanted to go visit him. I had been wishing hard that I didn’t have to make that long walk in the sun at the highest-UV part of the day, solstice or no solstice, and there they immediately were on the phone with no idea I needed them, offering well then, let us help you out with that. And so they drove me to the curb and waited. Circled when they had to and came back and waited patiently some more. It’s always a long wait. After awhile I went to the nurses’ station and asked with a grin if I could bum a wheelchair and wheel him out myself? (One is never allowed to walk out on one’s own, an employee must wheel you out.) They laughed and called down again and ten minutes later there you go. Took an hour and a half for me once, so ten minutes is practically the speed of light. And then just to top it off, when we got home Phyl and Lee asked a few questions and then went into our garage (brave people) and wrestled the fake tree out of there and the wires to the darn thing and set it all up for us, upright and lights on and there you go. I was expecting to have a grand total in the decorating department of a Christmas quilt on the floor with post office boxes on top. By myself. Whoopdedoo. And then head over to visit him at Stanford. He looks great. A friend was throwing a get-together tonight and he wanted to go and so after a few hours’ lying down here to rest up for it he had a great time, and Nina and Rod were there and offered Christmas dinner if we would throw in the oven time since theirs wasn’t working. Hey! Twist our arms! It will be a great day well spent. And, bless the poor old guy, now I don’t have to be in the same room for hours every day with a patient on the other side of the curtain with pneumonia and a 102.5 degree fever–in my autoimmunity, that was really really really not a good place to be, but since it was my husband on our side of the curtain there was no question but that I was to be there. I confess I would have been there more hours had it not been for that. The new hospital whose foundations they are now working on will all be private rooms to stop germs from spreading between patients so easily. They can’t build it fast enough. My Richard is home. I wore a Christmas sweater a dear friend gave me years ago, and the good Jewish wife who’d been there day after day too with who knows how much more to go whose elderly husband lay in that other bed and whom I fervently wished could be taking him home too wished me a heartfelt Merry Christmas as we went out that door free. I finally took an hour out to drive down to go buy birdseed: I was one scoop away from out. But that was just part of it. I got there and didn’t see Freddie but I did see John, her husband–they own the shop. The place was of course quite full. I interrupted him a moment anyway and handed him a small ziploc, asking if he would give it to her? Sure! And he went straight to the back room with it, a great big grin on his face. I told her if the green was too yellow I could overdye it with more blue. Oh, did you dye it too?! No, I had to admit, while making it clear that color was a malleable thing here–the point was for her to like it. She loved it. I’d wanted to do that for a long time. Good folks. She couldn’t wait to show it to another customer whom she knew was an avid knitter too. 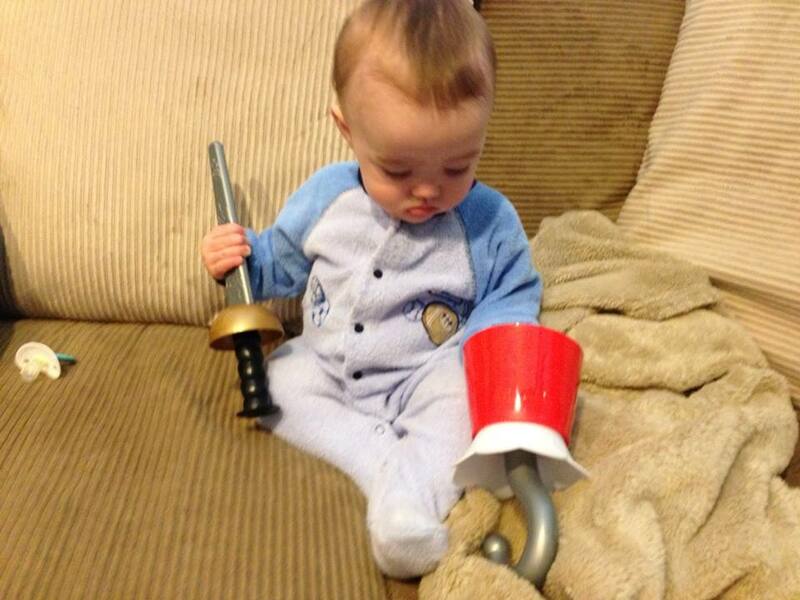 Hudson practicing for Talk Like A Pirate Day. I called my mom and wished her a happy birthday. A little later, my doorbell rang. It was such a joy to see those happy, expectant faces: I was expecting two, I got four. Nicholas and his dad, who had worked together and made persimmon puree and persimmon chutney from their tree; Nicholas was selling them to make Christmas money (and to earn that Lego robotics toy he really really wanted) and I had asked if I could buy some. And his little sisters: the twins whom I’d given yarn to to learn how to knit with. They asked if I’d gotten the fingerknitted-chained necklaces they’d made me? (I’d thanked them a week ago but being right there in person, the excitement needed to be shared all over again and the delivery of the gift made real.) Yes! And so I reached a few steps backwards and grabbed the things and wrapped them around my neck to their delight and I thanked them all over again. So were mine when I saw what they’d all brought me. I doublechecked to make sure I wasn’t depriving anybody else by buying the eight jars of puree–I love the stuff. Not only was it wonderful food from their tree and their hands and their stove but it was wrapped up beautifully, one even covered in a square of–wait for it–silk. A drapery sample (as labeled on the back) that added that perfect decorator’s touch that people like me can only wonder in awe at. How did they think of that?! Not in my skill set, that’s for sure. And then later we got to Skype with Parker and wish him a happy third birthday. 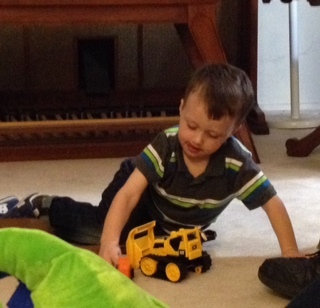 He proudly showed us a new toy, while Hudson found watching his big brother far more interesting than grownups waving on a screen. Next week we get to see the boys and their parents in person and run and play and sing and hug. I cannot wait. Michelle looked the best she has since the accident. Still, yes, and all that, but, I can’t tell you how hopeful and helpful it felt to see her today. And then I was off to Stanford. You know you knit a lot when you see someone in scrubs with a stethoscope and name tag and for a millisecond your brain assumes those are just covering up the first two letters before the r and the n. And then you guffaw silently at yourself and think yeah right, tell me another yarn. I eventually got told I needed my Purlescence time so, twist my arm, off I dutifully went. Got there quite late and there was a good crowd for the evening: Juanita threw her arms around me as I walked in and I quite squealed in delight at seeing her, afraid she’d already moved away but no, there she was, saying, I told you I’d see you again! Kevin had his portable piano, songbooks had been passed around, people were singing carols, smiles around the room at the happy greetings. And then there were secular songs. Then silly songs, with a few more sacred ones thrown in near the end. Juanita sang a solo and it was amazing to hear. The city of Paris recently did and they want her back, so, back she’s going for awhile. Good friends giving their best to all. And to all a good night. Made all the difference, and I am so grateful. Aaaaand… The flip side of yesterday’s post. The phone rang early in the morning confirming that today was going to be the day. Since when? That’s not what we planned or heard. And so the alarm went off for us night owls at 4:37 am and we got to Stanford just early enough for Richard to get to the ambulatory surgery check-in on time–but the parking! Hah. The long walk I thought I’d have to take from the garage to meet back up with him again after dropping him off? With the new hospital going up (I thought it was going to be on the other side of the place, y’know, over where the monster crane is, right?) that garage has been torn down and nothing has replaced it yet but I didn’t know that yet in the dark. I have no idea what I would have done if he hadn’t told me to just go home and go back to bed and he would call me when it was over. Then they didn’t send him home. No big deal, but still. On a lighter note, don’t miss the piano playing along with passersby according to whatever they were doing. If you’re local and you need a piano tuned, you need this guy. He’s the best. I don’t remember what I saw him for; just the reaction years ago of this family practitioner, the most gentle and caring doctor, asking, Is there anything else going on? I could only laugh. He’d seen me previously as the on-call when my children had been babies running around his legs in the examining room, so he did know my face, but not that I’d since been diagnosed with lupus. And then asthma. And then nine years after the first, Crohn’s. His shoulders fell, his pen went quiet on the page, he looked at me steadily as he took that in a moment, knowing I still had children at home to raise at the time. A bit of wonderment at the relatively-healthy-looking woman of good cheer in front of him, then, “You’ve got a full plate.” As simple and direct a summing-up as I have ever heard. It was one of those moments where someone says the right thing at the right time in the right way and makes everything okay. I have never forgotten it. Michelle was having post-accident problems that warranted being seen again to make sure there wasn’t a break, so we took her to the clinic. The nurse took her back to where they did x-rays, they talked about physical therapy; we waited. I knitted. Made good progress on the thing, too, to where you could actually see what the lace was going to be when it grew up. She came out with one of those clunky black strapped-on one-size-doesn’t-fit-most thingummies on her foot, and while she was filling us in on the visit, turned out he was again the on-call doctor covering for today and he came out to greet us and I wonder whether to see if we her parents were who he thought we would be? But he had one more thing to mention re her knee, so he came and good, we hadn’t left yet. He’s Richard’s regular doctor, he’d seen me back in February and remembered the days, and there we three were, here still, together, supporting each other…and he was beyond delighted, a moment again of stopping and taking it all in–in joy this time. I could just see the wow, she’s not a baby anymore! twinkling in his eyes. Oh, she’s so going to love this colorway. Oh, she’s so going to love having been knit for. Oh, she’s so going to love how soft this is. I am having so hard a time putting this down to give my hands a break. It’s been a good problem to have. It feels great to be back at it. Me: That little snapping sound at the very very end. (Miming breaking a yarn.) It’s very satisfying. 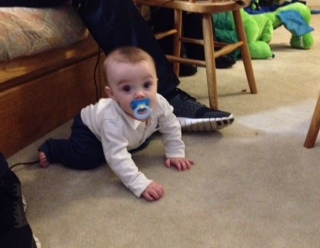 Him with a grin: I’m sure Parker could help you make many many snapping sounds. He’s right, I’m going to have to move some of that yarn before they come….